Already in 2009, in the context of developed countries as a group, the EU had set an objective to reduce its GHG emissions by 80-95% by 2050 relative to 1990. The Commission in its 2018 roadmap to 2050 “A Clean Planet for All” presents a vision to achieve climate neutrality (net zero emissions) by 2050. In its October 2014 conclusions, the European Council decided on a target of a reduction of at least 40% in domestic emissions by 2030 compared to 1990. This was further broken down into reductions in the ETS and non-ETS sectors amounting to 43% and 30% by 2030 compared to 2005, respectively. In setting these targets, the European Council noted that “the multiple objectives of the agriculture and land use sector, with their lower mitigation potential, should be acknowledged, as well as the need to ensure coherence between the EU’s food security and climate change objectives.” Nonetheless, the Commission Communication The Future of Food and Farming in 2017 notes that the 2030 Climate and Energy framework calls upon the farming sector to contribute to the economy-wide emission reduction target of -40% (relative to 1990) by 2030. Specifically, agriculture is one of the sectors covered by the Effort Sharing Regulation (ESR) which foresees a reduction of 30% in ESR emissions by 2030 compared to 2005. Agricultural emissions, on the evidence of the chart above, are going in the wrong direction. Agricultural emissions in national inventories are primarily methane (CH4) and nitrous oxide (N20). To set EU targets consisting of a basket of gases, emissions of these different gases need to be aggregated to CO2eq. The EU currently mandates that the aggregation metrics should be based on the 100-year time horizon global warming potentials (GWP100) in the IPCC Fourth Assessment Report (AR4). The national CAP Strategic Plans will be required to address climate mitigation unless a country makes a convincing case that this is not a priority objective for it. 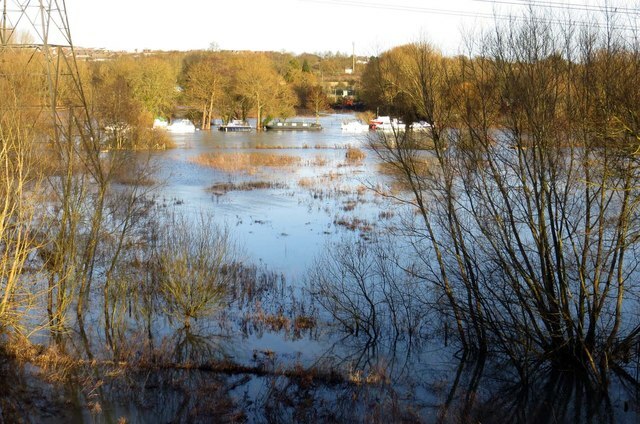 The challenges facing individual countries are slightly complicated by the implications of the ‘Paris rulebook’ agreed at the COP24 climate conference in Katowice, Poland in December 2018. This will have the effect of changing the aggregation metric used to combine the different gases into CO2 equivalents, giving a greater weight to methane and a lower weight to nitrous oxide. Thus at some point between now and 2020 after which the 2030 targets begin to take effect the EU Commission will adopt the AR5 metrics to aggregate different gases to CO2eq. The different GWP100 values for these gases in terms of CO2eq are shown in the following table. As noted, the effect of this change will be to slightly increase the weight of methane in agricultural emissions and to reduce the weight of nitrous oxide. Metric values in AR5 are presented both with and without including climate–carbon feedbacks for non-CO2 gases. Climate warming due to CH4 and N2O tends to reduce the efficiency of natural carbon sinks, and thereby increases the concentration of CO2 in the atmosphere. The GWP for methane is given as 34 and for N20 as 298 when these feedback effects are taken into account. AR5 notes that the treatment of these feedback effects across gases in previous IPCC reports has been inconsistent, in that they have been included for the reference gas CO2 but not for the non-CO2 gases. It further notes that : “Though uncertainties in the carbon cycle are substantial, it is likely that including the climate–carbon feedback for non-CO2 gases as well as for CO2 provides a better estimate of the metric value than including it only for CO2.” I have used the GWP100 value for methane and nitrous oxide without feedback effects for consistency with AR4. However, the higher values of 34 and 298 might well be adopted by the Commission for EU reporting depending on how the Paris rulebook guidelines are interpreted. 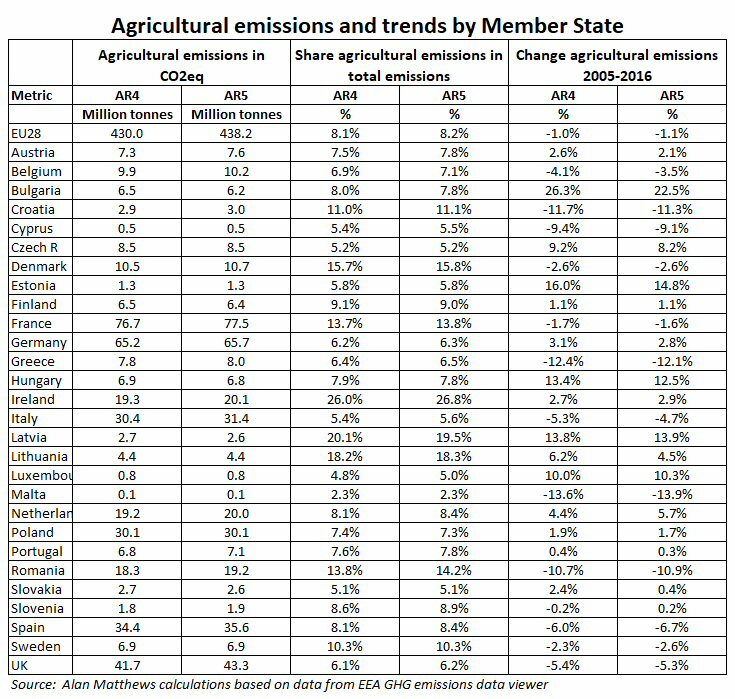 I set out agricultural emissions and the trends in those emissions by Member State using both the current AR4 metric and the proposed AR5 metric in the following table. To calculate the latter, I have reweighted methane and nitrous oxide emissions using their AR5 values instead of their AR4 values. To calculate the share of agricultural emissions in total national emissions using AR5 values, only methane and nitrous oxide have been reweighted; the GWP100 values for hydroflurocarbons and other GHGs have been left unchanged. 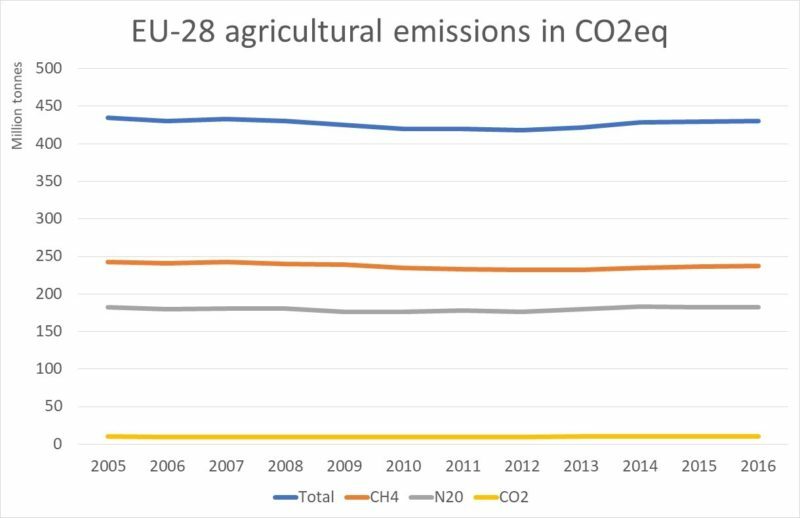 The first point to note is that using the AR5 metric slightly increases the overall size of agricultural emissions in total emissions in the EU-28 although the change is hardly dramatic (share of 8.1% in total national emissions using AR4 metrics and 8.2% using AR5 metrics). However, for some countries such as Ireland (with a large share of methane emissions in total agricultural emissions), the effect of moving to the AR5 metrics is more significant. What is more striking is the very different trajectories in Member State agricultural emissions over the period 2005-2016. 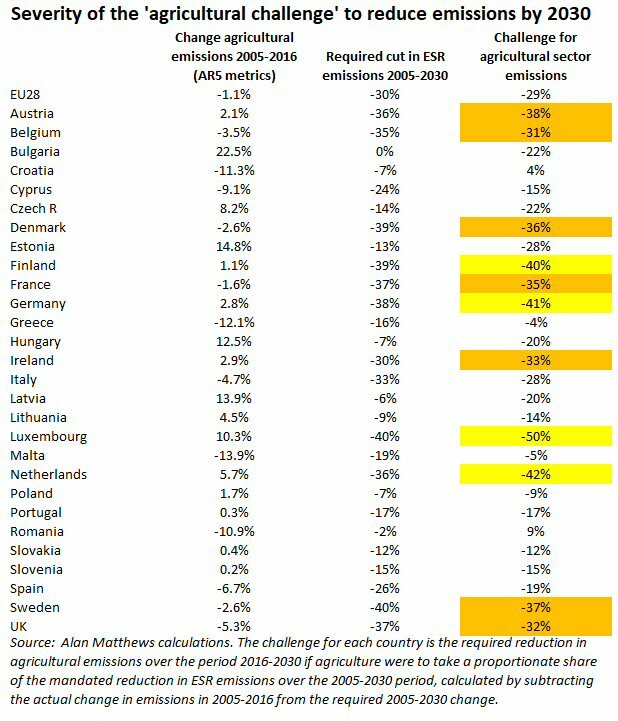 While overall emissions have gone down at the EU level by 1.0% (1.1% if we use the AR5 metric), there are several countries where emissions have increased over the period. Some of these are newer Member States, such as Bulgaria, Hungary, Estonia, Latvia and Poland, but there are also some older Member States, such as the Luxembourg, Netherlands, Ireland and Austria among this group. Which countries face the most severe challenges to reduce agricultural emissions? Which countries face the most severe challenge to reduce agricultural emissions in the period to 2030? One simple way to answer this question is to subtract the reduction/increase in emissions over the 2005-2016 period from the required ESR reduction in the 2005-2030 period. This is done in the table below, using the AR5 metrics which will apply over this period. This gives a first impression of how large the reduction in agricultural emissions should be in the coming years, on the implicit assumption that agricultural emissions should fall on a pro rata basis with other emissions in the effort-sharing sector. There is of course no reason why this should be the case. Those countries where agricultural emissions are a relatively small share of ESR emissions will be able to ‘shield’ the agricultural sector from cuts if they can make larger cuts in transport or buildings or small industry. This will be much more difficult for a country like Ireland where agricultural emissions make up 45% of ESR emissions. Also, several countries have access to flexibilities they can use to meet their 2030 ESR targets which are not shown in the table below. However, as a first approximation the table serves to rank countries according to the challenge they face in bending their trend in agricultural emissions to meet their 2030 targets. Four countries, Luxembourg, Netherlands, Germany and Finland (shown in yellow) would have to reduce agricultural emissions in the next 14 years by more than 40% if agriculture were to make a pro rata contribution to the reduction target for the ESR sector. A further six countries, Austria, Belgium, Denmark, France, Ireland, Sweden and UK (shown in orange) would have to reduce agricultural emissions reductions in the range 30-39% to achieve this objective. Some of these countries have access to flexibilities which will reduce the level of ambition necessary to meet this goal. Also, the importance of agricultural emissions in total ESR sector emissions will influence the priority given to reducing agricultural emissions. There are just two countries, Croatia and Romania, where the drop in agricultural emissions in the 2005-2016 period is already more than enough to ensure that agriculture contributes pro rata to the required ESR reduction, provided emissions remain at or below the 2016 level. Overall, EU28 agricultural emissions fell by just over 1% between 2005 and 2016 and have been rising since 2012. If reductions in agricultural emissions were to make a pro rata contribution to the mandated reduction in the EU’s effort-sharing sectors by 2030, the reduction between 2005 and 2030 should be 30%. This would require a cut of 29% in agricultural emissions over the period 2016-2030 compared to a cut of 1% over the period 2005-2016. 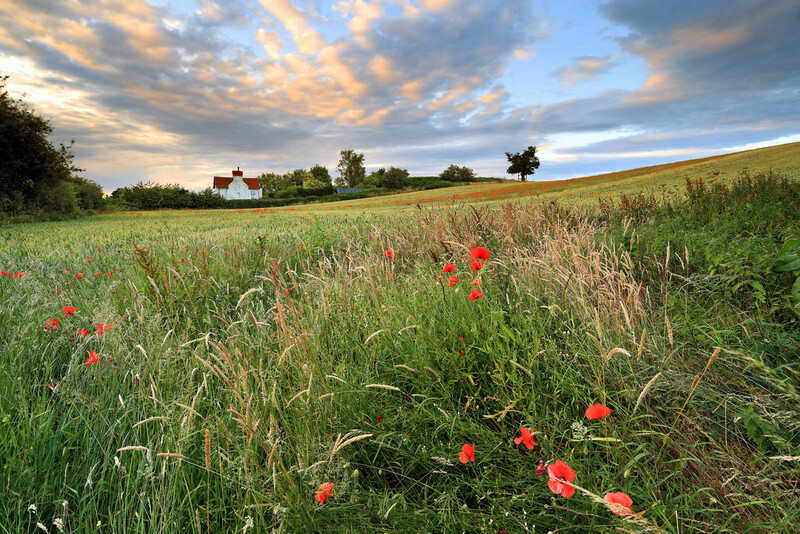 The European Council conclusions explicitly noted the lower mitigation potential in agriculture in its October 2014 conclusions on the Climate and Energy Framework. Even taking this caveat into account, agricultural emissions are going in the wrong direction. Not all countries are in exactly the same position. Countries have different reduction targets in the ESR sectors, and agricultural emissions have trended differently in different countries. A simple indicator, subtracting the actual change in agricultural emissions in the period 2005-2016 from the required change in ESR emissions in the period 2005-2030, gives a first ranking of countries according to the challenge they face in reducing agricultural emissions in future. Some countries can make use of flexibilities to meet these targets. Other countries will opt to make bigger proportionate reductions in the other ESR sectors such as transport or buildings. But these choices will need to be justified in the CAP Strategic Plans. More importantly, the Plans will need to show the efforts that must be made to bend the curve of agricultural emissions depending on the choices made. Steve Daniels and licensed for reuse under this Creative Commons Licence. Update 14 April 2019: A paragraph explaining the higher AR5 value for methane of 34 and of 298 for nitrous oxide was added. A reduction in greenhouse gas is important but this is not what is being measured. The target can easily be achieved by reducing activity within the EU and exporting production perhaps to somewhere producing higher emissions. In addition, there is no intensity measure: I may double my output and increase my emissions by 15% and thus foul of the target while reducing emissions per unit of production. I may have the lowest emissions of all producers/countries for a product and have to reduce further. 1) Grass used as a feedstock for AD will frequently fail the RHI target (despite reducing GHG) but there is no recognition that if it cannot be used it will be destroyed releasing GHG. 3) A reduction in particulates in tractors will often result in higher ghg emissions. 4) There is no common financial value for GHG saving. The policy is a mess. The system is broken?